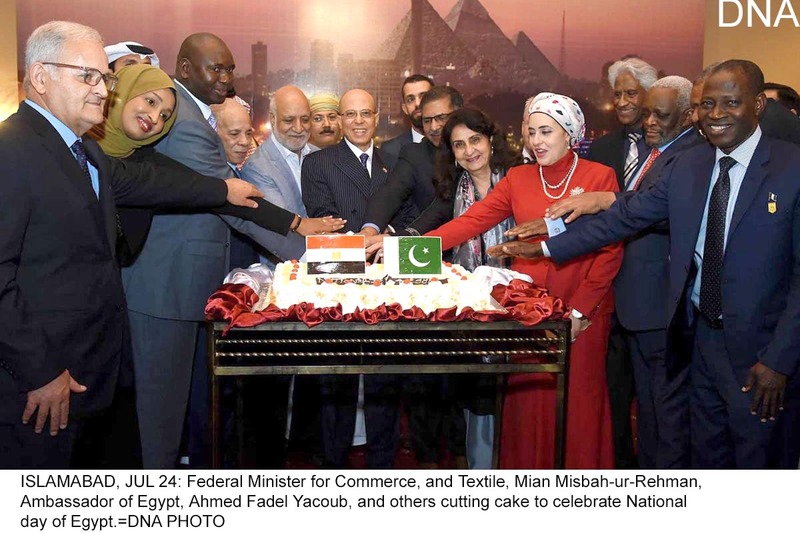 ISLAMABAD, JULY 24 (DNA) –Ambassador of Egypt Ahmed Fadel Yacoub has said both Egypt and Pakistan enjoy historical relations that date back to even before the establishment of Pakistan.Muslims of this region were always coming to Egypt to study at al-Azhar al-Sharif, the university that is more than 1000 years old. It is also worth noting that Qaid Azam Mohammad Ali Jinnah visited Egypt in 1946, and met with Egyptian political leaders and the Grand Imam of Al-Azhar. “It is my pleasure to welcome you all and thank you for your presence tonight to commemorate the national day of Egypt; the 23rd of July. On that day, 66 years ago, in 1952, Egypt was, in spite of its legal independence, still under foreign occupation. It was suffering political unrest that manifested itself in the Cairo Fire in 1951, in a military failure in the war of 1948, and in deteriorating social conditions”. He also endorsed the Paigham -e- Pakistan narrative. This Fatwa (religious opinion) came about within the framework of the intellectual battle that we are all fighting against extremism and terrorism, and which is no less important that the military and security battle.